The THOROUGHBREDS™ Club you know and love just got even better. Now powered by XB Rewards, new and existing THOROUGHBREDS™ members can enjoy the most inclusive and rewarding loyalty program in horse racing. It's free, so sign up today and get your XB Rewards Card. With your new XB Rewards Card, you can still swipe at the gate for 50% off admission, and now swiping at the machines will earn Rewards Points for all your bets made on-track. That's in addition to the Points you'll earn betting online and on mobile! Have an online Xpressbet wagering account? You can combine it with your on-track THOROUGHBREDS™ powered by XB Rewards account and earn Bonus Points too as you gain higher status levels - Silver, Gold, Platinum and Diamond. And if you're already a veteran THOROUGHBREDS™ member, we'll start you at a status level commensurate with your level of on-track wagering. If you don't have an account, you can sign up online at www.xpressbet.com or with a representative at the Main Thoroughbreds Center inside Santa Anita Park. Current THOROUGHBREDS™ members can visit the Main Thoroughbreds Center inside Santa Anita Park, located at the east end of the Grandstand, to get a new THOROUGHBREDS™ powered by XB Rewards card. It's that simple! If you're a new member looking to join, you can also sign up at the Main Thoroughbreds Center. It's that simple! Membership is free, so join today and don't forget to swipe! Must be 18 years old to sign up. 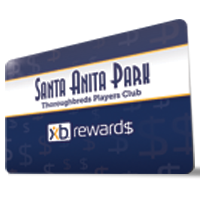 For more information, please visit XBRewards.com/Santa-Anita-Rewards, where you can view the full redemption catalog and our FAQ.